Copper, an essential trace element needed by the human body, can be found in various food and non-food sources. You have between 75 and 150 mg of copper in your body at any given time, with half of it found in your bones and muscles. Another 10 percent is found in the liver, and the balance is found in the brain, kidneys and heart. In the case of the rare inherited condition known as Wilson's disease, a diet low in copper is necessary to avoid certain serious health issues. The best food sources of copper are liver, shellfish, dried brewer’s yeast, olives, nuts, beans, cereals, meat, fish and poultry, and dried fruits. Non-food sources include copper food-storage containers. The copper leaches from the container into the food. Copper pipes that carry water also leach a small amount of this essential trace mineral into your water supply. 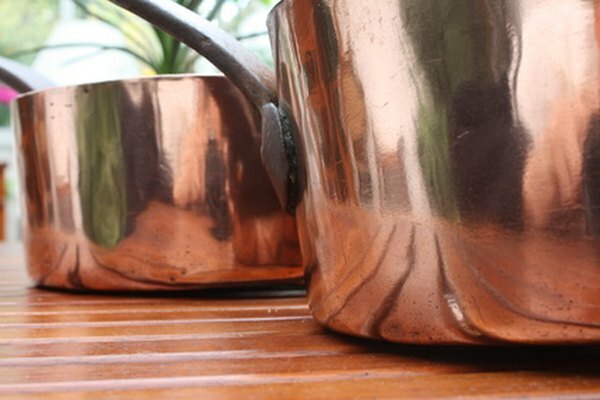 And last, but not least, are copper kettles and cookware. Some cough suppressants and decongestants also contain trace amounts of copper. The adult RDI for copper is 900 mcg daily. This amount is relatively small, considering trace amounts are found in so many common food items. Meeting your daily intake is easy, unless your diet consists mainly of processed foods, which are generally devoid of this important mineral. Even a single 3 oz. serving of meat, poultry or fish daily should help you avoid a copper deficiency. Copper deficiencies have been noted in malnourished children who consume little to no meats or protein. Individuals with malabsorption problems, premature babies and people living on highly processed and refined foods can experience a copper deficiency. Long bouts of diarrhea or vomiting can also create a deficiency. Symptoms of a deficiency in infants is a failure to thrive, pale skin, diarrhea and prominent veins in the skin. In adults, a copper deficiency can cause anemia, water retention, irritability, brittle bones and loss of your sense of taste. This rare disease process causes your body to store excess copper in your heart, liver and brain until it becomes toxic instead of excreting the excess copper into the intestines and eventually out of the body. Your doctor will prescribe a medication that will help your body to excrete this excess copper, but you will also need to adjust your diet, limiting your copper intake to less than 1 mg daily. Don’t drink mineral water containing copper, maintain average to small portions of meat, fish and poultry and don’t use storage containers or cookware made of copper.